A group of Indian Navy personnel on Sunday conquered Mount Everest, 50 years after the world's highest peak was first scaled by Navy climbers. Navy's association with Himalayas dates back to 1965 when Capt MS Kohli led first successful expedition. New Delhi: A group of Indian Navy personnel on Sunday conquered Mount Everest, 50 years after the world's highest peak was first scaled by Navy climbers. The feat by the Navy team comes a day after BM Sharma, popularly known as Breeze Sharma, became the first Defence Civilian of the Indian Navy to scale the peak. Four Navy personnel -- Lt Commander Bikas Maharana, Lt Shashank Tiwari, Lt Commander CS Yadav and Lt Anant Kukreti -- started the final push at 8 pm yesterday and braved extreme cold, snowfall and high jet streams before finally making it to the top where they unfurled the Navy's flag at 6:30 am on Sunday. A group of 24 climbers from ships, submarines and aircraft squadrons of the Indian Navy were part of the expedition, titled 'Sagar Tal se Sagar Matha (from Seabed to Summit)', Navy Spokesperson Capt DK Sharma said. A ceremonial 'Ice Axe' with the Naval Ensign was taken to the bottom of sea by diving off the coast of Karwar and has now been taken to the highest point on Earth, depicting the Navy's efforts to soar from depths of ocean to the summit, he said. The Indian Navy's association with the Himalayas dates back to 1965 when Capt MS Kohli led the first successful Indian expedition atop the world's highest peak. In preparing the climbers for the expedition, the Navy has conducted expeditions to various peaks in the country over the past two years. Breeze Capt Sharma's dreams to climb Mount Everest had run into rough weather when he got trapped in an earthquake induced-avalanche that hit the Everest base camp in 2015. Despite being buried under heavy snow, Capt Sharma managed to get out, and even helped local authorities in the rescue operations. 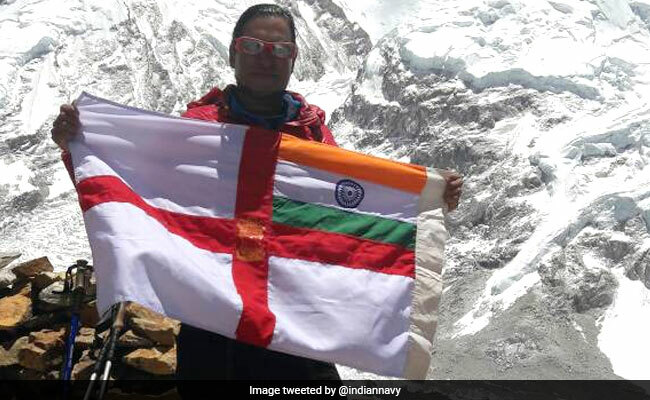 The Nepal government had extended Capt Sharma a permit to scale the peak for 2 years and yesterday the climber become the first Indian Navy Defence Civilian to summit Mt Everest, the Navy official said.